Even though there’s a heat wave in Los Angeles I’m totally on board with the sudden influx of all things pumpkin spice. 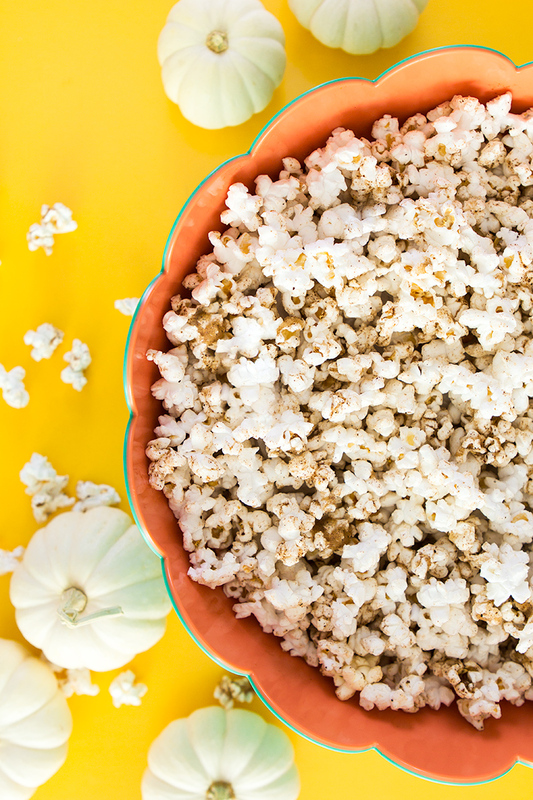 That’s why today I’m sharing a super easy pumpkin spice popcorn recipe! It’s the perfect fall snack and you can make it in under 5 minutes so what are you waiting for? If you’ve visited Trader Joe’s recently you might have noticed that there’s pumpkin spice everything. I may or may not have filled my cart with pumpkin cookies and ice cream because it only comes around one time a year. But this easy peezy popcorn recipe is made with pantry staples like microwave popcorn and spices so you can enjoy it well after the last PSL is served. Watch the video below to see how to make it! Combine melted butter, sugar and spices in a small bowl. Stir until combined and sugar is mostly dissolved. Add popcorn to a large bowl. Drizzle sugar and spice mixture over popcorn and fold the mixture into the popcorn using a large spatula. Enjoy immediately! I used lightly salted, unbuttered microwave popcorn for this recipe and it was delicious! If you love kettle corn you can use that too. I just recommend staying away from pre-buttered or really salty popcorn since you add so much flavor with all the spices. Love all things pumpkin spice? Follow my Pinterest board dedicated to this perfect fall flavor. And be sure to follow my Facebook page so you’re among the first to see new fall inspired videos!